We’d love your help. Let us know what’s wrong with this preview of Once We Were Like Wolves by M. Todd Gallowglas. In this second volume of TEARS OF RAGE, Julianna continues to come to terms with being named as high priest by the god of vengeance she freed from his thousand year prison. Still fleeing from her enemies, Julianna has her first encounter with her new god's followers, and she learns that being the first chosen comes with a higher price than she expected. To ask other readers questions about Once We Were Like Wolves, please sign up. Does anyone know when this is being re-released? This book has lots of depth (really wonderful world building - especially in terms of divine and mortal history and how the beings interact - but it never bogs the action down). Almost zero exposition that's not covered through normal thought/conversation. Also, the characters move through the plot naturally. Events aren't forced and solutions, even using powerful magic/miracle, are well-thought out and logical. 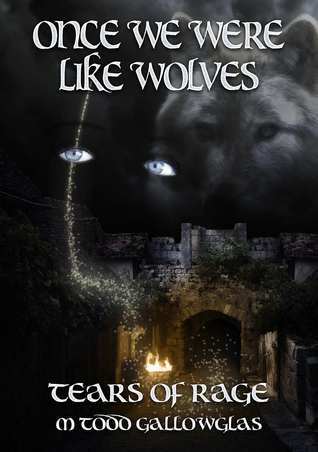 Even better than the first book, Once We Were Like Wolves heightens the action, deepens the characters, and broadens the lore of the Tears of Rage series. I particularly liked the development of our main character, Julianna. Darn it, I really loved this book. Had to buy the next one. Exciting and well written. Finally! It has taken me forever to get this here. I am glad I finally can share this. Once We Were Like Wolves is the sequel to Tears of Rage and I am glad to report, I think this was better than book 1. The story is amazing and we get more characters that are very interesting. One in which I think I have a crush on. Oh yes, I have a big smile on my face. This story continues to follow our main character Julianna who has just become the new Lord Morigahn. Grandfather Shadow has just been released from his prison and he has plans. But in order for those plans to go through, Julianna must truly embrace what she is now and how to handle her new powers. Everyone, gods and humans alike have their own agenda where Julianna is concerned. So she has a lot of growing to do and she must do it quickly because lives are on the line. Gallowglas did such a wonderful job with this story. I love our main character Julianna. All this power has basically fallen into her lap and she doesn't go nuts with power. I love that we see a vulnerable side to her. That she is as scared about what she is and is trying to accept that she won't have a normal life. I love that we get more of Faelin, Julianna's best friend. He knows more about what it means to be the Lord Morigahn and helps her great deal in the book. I both love and hate that we see they have an attraction to each other, but they can't be together because of what she is. I hope we can see more of that in the future. I love that this time around we have a lot more story. We have different subplots and they all flow together beautifully. I had a little issue with that in the last book. We had a lot of characters, but we didn't learn a lot about them. In this one, we have those characters and more, and we get a taste of all of them and what they are about. I am especially excited over the new character Damian. He seems to find himself in interesting predictaments, but he thinks fast on his feet which really saves him. He definitely has luck on his side (that is what I call it) and he has some connection to the higher ups, but we don't know yet. One thing I will say is that he doesn't seem to fit in with the time of the book. Damian has this sort of Old Western cowboy feel to him. Definitely an adventurous one, that is for sure. This is actually the first M Todd Gallowglas book I purchased. The title grabbed me and wouldn't let go. Then I found out it was the 2nd of the series, so I started with First Chosen instead. I'm very glad I read them in order. Once We Were Like Wolves picks up where First Chosen leaves us. Julianna has come out of all the conflicts victorious enough to satisfy the reader, but there are many realistic things she did not conquer, and her very existence has changed. We go through all the emotions w This is actually the first M Todd Gallowglas book I purchased. The title grabbed me and wouldn't let go. Then I found out it was the 2nd of the series, so I started with First Chosen instead. I'm very glad I read them in order. Once We Were Like Wolves picks up where First Chosen leaves us. Julianna has come out of all the conflicts victorious enough to satisfy the reader, but there are many realistic things she did not conquer, and her very existence has changed. We go through all the emotions with her as she tries to decide if the gods sticking their noses into human business is a good thing or something heinous. We meet new characters in Wynd, Korrin, Nathan, Aurell, and Allister. We meet the Stormcrows. We see more of how the society of the world is structured in the order of precedence of nobility and common folk, the conquerors and the indigenous people of the land. And we learn more about the gods, the system of magic, and the priestly orders. But, like First Chosen, we have fight scenes that further the story, characters meeting and battling their suspicions while good fights against evil, Julianna learning to be a leader, machinations on both the celestial and mortal planes, and the new edition has very few typos. To me, Wolves feels more fast-paced than First Chosen, and it feels like there is even deeper character development, and again it stands up really well to re-reading. One of the things I really like about Once We Were Like Wolves is that the bad guys are well-rounded and feel like real people. They have their tender moments, their worries, their ambitions. We can almost see why they chose the path they did. I really hate one-dimensional villains, so these villains are refreshing. Gallowglas continues the saga of Julianna as the new Lord Morigahn. Grandfather Shadow has great plans for her but first she must figure out how to use her gift of miracles if she is to beat her enemies. As always, the Gods and Goddesses are playing their own game, often placing the mortals right in the middle. However, Julianna isn’t alone. With her faithful friend, Faelin, and a band of followers, she sets out to become the most powerful Lord Morigahn the world has ever known. What I really lo Gallowglas continues the saga of Julianna as the new Lord Morigahn. Grandfather Shadow has great plans for her but first she must figure out how to use her gift of miracles if she is to beat her enemies. As always, the Gods and Goddesses are playing their own game, often placing the mortals right in the middle. What I really love about Julianna is that she doesn’t just toss her power around to solve every problem. She must often use her wits more than magic, which makes her a truly awesome character. The only thing that detracted from the story was the amount of typos scattered throughout the book. Despite this, I look forward to the next book in the series to see what will happen to Julianna in her role as the Lord Morigahn. This book continues where book 1 left off and the adventure just keeps on coming. Juliana is still learning about her new role in life and now not only must she learn about what she can and can't do but she must also figure out where everyone else stands in this too. Are they with her or against her. As the first woman Lord Morighan in history, she is in uncharted territory and only has her own wits, Faelin and Grandfather Shadow for support. This story keeps on getting better. You are drawn in t This book continues where book 1 left off and the adventure just keeps on coming. Juliana is still learning about her new role in life and now not only must she learn about what she can and can't do but she must also figure out where everyone else stands in this too. Are they with her or against her. As the first woman Lord Morighan in history, she is in uncharted territory and only has her own wits, Faelin and Grandfather Shadow for support. This story keeps on getting better. You are drawn in to how she is trying to learn on the hop and survive at the same time. The lessons she learns are hard ones and Mr Gallowglass completely draws you in with her. I found this book to be pretty enjoyable but was a bit confusing for me. Part of the confusion is due to the naming, there are quite a few complicated names that I have no clue how to pronounce. Also, the usage of the different languages is nice but there usually isn't any explanation of what is actually meant by them so I have no clue what's going on at some points. I will finish the series because it is does have interesting magic system and the god hierarchy is interesting. I liked the first book, but this one I loved. The plot moved much faster than the first one. Most likely, because the much needed world building was done. The interplay between the Gods, mortals, and the Lords of Judgement is fun, exciting, and has enough of a twist to feel new. And, my love of Faelin and Juilanna continues to grow. I already brought book three, and looking forward to it. It really needs an proofreader and/or editor. The errors in this story can be very distracting, how many times can you change the spelling for a character's name on the same page? Annoying. But the story is still good enough for me to buy the next book. Todd, please find a better proofreader. The story of the celestial war with people as puppets continues, fast-paced and filled with action. World-building is kept to a minimum to focus on the basic plot, keeping the story fantastical without over-simplifying. The characters evolve given the context of the dire situations they find themselves in and do so in ways that largely credible. A quick and fun read. I enjoyed the book. It was good to meet new characters and new players. We start to see a bigger picture of all the schemeing and manuvering that is occuring in the constant quest for power. Looking forward to the next book. Started saying the word "miracle" too much, and some errors that make it seem as if the book was dictated (homonym problems). Otherwise, good story and interesting premise. Excellent continuation from 1st book. Elements are starting to all come together and flesh out the characters and the story itself. Can't wait for the next one. A good book filled with love, hate, friends, and enemies. A bit confusing at times, but overall fun story. Someone who likes action and adventure might enjoy this book.